The first and obvious way is to use Resend action that is available in the Net and Console panel context menu. It's the simplest method, just right click on an HTTP request in the Net panel or on XHR log in the Console panel and pick the Resend menu item. You should see a new request displayed. Both requests will be the same since Firebug preserves headers, posted data, etc. You can use this test page to try it yourself. You might prefer OS system command line and its cURL command line tool. 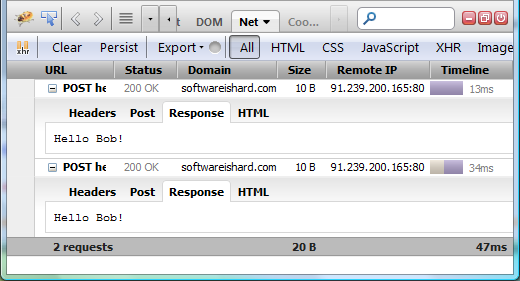 Just open Firebug UI and select the Console panel on the page you are debugging. Would you be interested to have another way to resend a request? Would it be useful to have also Copy as Wget? If yes star this issue, so we know how high priority it is for us. Another major tribute to Firebug is the amount of resources Mozilla has dedicated to trying to replicate it ... and so far, many months later, it still cant! Not even close. Each and every time I try another browser's developer tools (which would probably never have been developed without Firebug's creation), I find annoyances in their own native developer tools that just do not exist in Firebug.